St.Peter’s opted for a class by class Health Day. Each of the 8 classes had fun learning about portion sizes, using grapes and comparing hand sizes…. After discussing a healthy balance using the ‘eatwell plate’, in small groups they guessed the amount of sugar in some everyday items before helping to chop and prepare fruit for making smoothies on the bike. 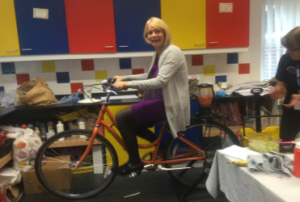 The younger classes shouted encouragement to their teachers (and Headteacher) who pedalled to blend their smoothies! The older years had a turn each, relay style! 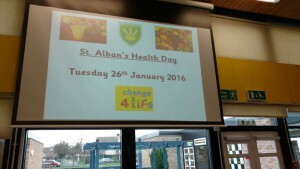 The C4L team and the Smoothie Bike went off to visit St Alban’s Primary on 26th January. We met all 7 classes from Reception to Year 6 and started with lots of fun with portion sizes and the Eatwell Plate. An excellent day and we had some great feedback from the children, who asked some intelligent questions throughout. 8 classes of very excited KS1 children awaited our arrival at Gidea Park Primary School. Even those as young as Reception age knew about the minimum 5 portions a day of fruit & vegetables, which was a good way to lead into helping them determine ‘me-size’ portions using grapes and comparing hand sizes. 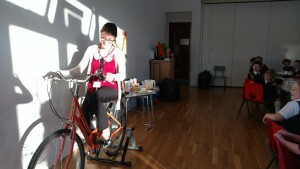 They all enjoyed learning about a balanced diet using the Eatwell Plate and were amazed at the amount of sugar in a bottle of Coca Cola, but the bit they were all waiting for was the Smoothie Bike! Each child peeled and sliced bananas to add to our frozen fruit, ready to be blended by the fast-pedalling teachers. Everyone got a taster drink and went off with a big smile. It was a fun day and we hope to be back soon for the KS2 years.